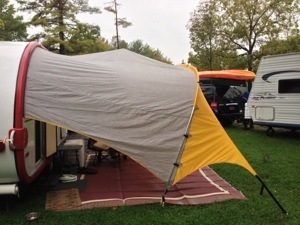 It’s a rainy day in Cuyuga (pronounced Queue-gah, we think) and it’s the first chance we’ve had to try our new rain pole for the Thermarest awning. The first time we used the Thermarest and it rained, rainwater pooled right in the middle of the awning and I mean it POOLED. Tens of gallons. We had to watch and push up in the middle of the awning to dump the water out before the tonnage brought down the canopy. 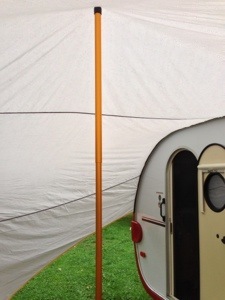 We had some success doming the awning with a Rube Goldberg broom on top of an ice chest on top of a chair so the water would run off so we found an foldable pole at campmor.com Noah’s Pole. I drilled a cork to put over the sharpish peg on one of the pole. This morning before the rain started here I put up the pole in the middle of the canopy and it works! I did put a extra guy rope on the front of the awning to help keep tension on it, too. Here’s some pictures. So now the water runs off — like water off the proverbial duck’s back. This entry was posted in T@DA and tagged improvements by Judy Crankshaw. Bookmark the permalink. Sometimes the best designs need a bit more creativity!!! Smart idea. Looks like it worked perfectly. I hope there’s not too much rain for you to get in some riding. That’s such a beautiful area.